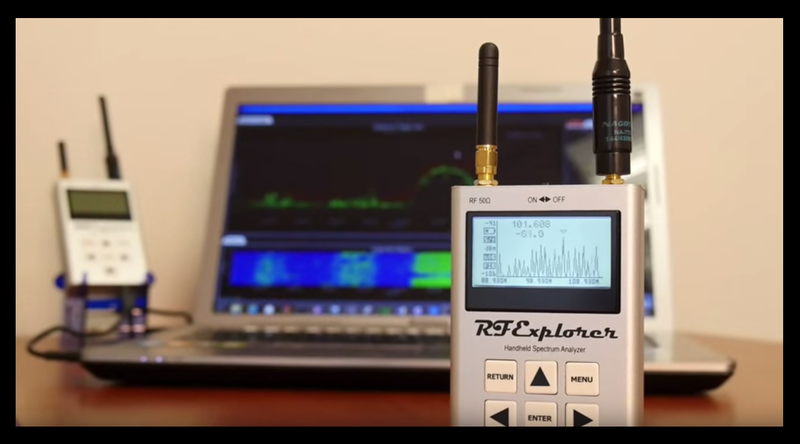 RF Explorer is the latest breakthrough device in low-cost, RF spectrum analysis. It operates both as a standalone, handheld RF spectrum analyzer and also interfaces with a PC running more sophisticated data analysis software. There are several models in the RF Explorer series of RF spectrum analyzers that span different frequency ranges -- from 15 MHz up to 6100 MHz. Don''t let the price fool you -- the performance of these small, affordable devices compares favorably to more expensive and bulky test equipment. 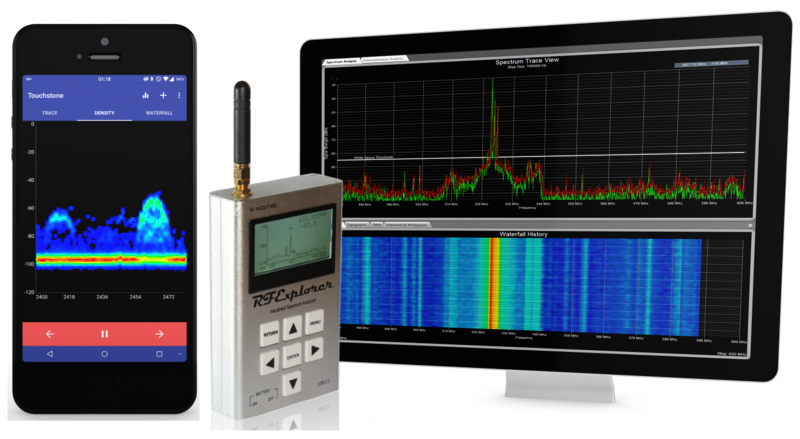 RF Explorer was developed by Arocholl and is distributed by Nuts About Nets -- developers of wireless diagnostic tools. Nuts About Nets also supports RF Explorer by developing PC-based software to enhance the functionality of the device. Visit us on the web at www.NutsAboutNets.com. The new 6 GHz RF Explorer models are now available -- check them out here.. They cover both the 2.4x and 5.x GHz ISM bands and are the perfect diagnostic tool for monitoring and troubleshooting Wi-Fi networks. An RF spectrum analyzer is the instrument of choice for initially detecting and identifying sources of RF interference and then subsequently used to monitor the health of a wireless system. An RF spectrum analyzer is a basic tool used for observing transmitted radio frequency signals – and aids the user by providing a view into the local RF environment. This RF view can be used to help detect the presence of RF transmissions that are the source of interference. Armed with this information you can attempt to track down and eliminate the source of RF interference. Alternatively, you could choose to re-configure your own wireless gear to operate in a different freqency range of the RF spectrum that is less prone to RF interference from other wireless devices competing for bandwidth within the same frequency range. Regardless of your technical background, RF Explorer is a diagnostic tool you are bound to love. The combination of standalone, handheld operation and PC-based, data acquisition and analysis are unique in the market place. Arocholl's commitment to quality and low-cost are unmatched -- you'll wonder how you ever got along without this device. Several models to choose from that differ in the frequency range they support. Light-weight and small in size, can operate as a stand-alone, handheld device. Internal, rechargeable battery provides up to 16 hrs+ of continuous run. LCD display of 128×64 pixels offers great visibility outdoors. Using USB cable can connect to Windows PC running more sophisticated data acquisition and analysis software. Comparable to RF spectrum analyzers that cost many times more. Excellent dynamic range, sensitivity, and resolution bandwidth. Being surrounded by wireless devices and RF transmissions means that sources of RF interference and intermodulation distortion (IMD) can come from anywhere. In such a "hostile" RF environment there are diagnostic tools available to help us mitigate the negative affects of RF interference and IMD on our wireless audio gear and applications. RF Explorer plus Clear Waves software is a “game-changer” — the industry’s first product that includes both realtime RF spectrum analysis and intermodulation analysis. Clear Waves is a software / hardware product that provides precise, wideband RF spectrum scanning, visualization and channel coordination that is critical for success when working in a crowded RF environment.